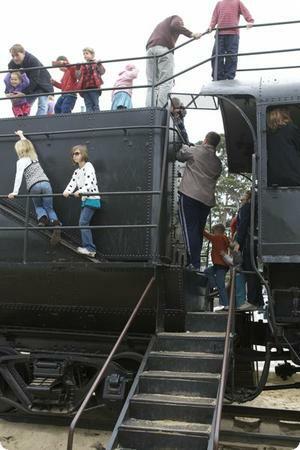 While I was thrilled to see the train engine I climbed as a child still at Dennis The Menace Park in Monterey, I was also surprised to see that kids are still allowed to climb all over it. 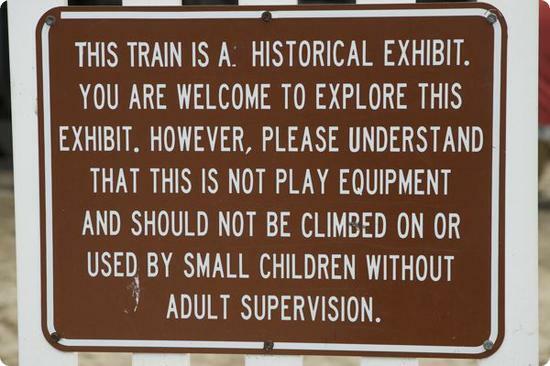 California is a particularly litigious state, and I imagine that local parents have fought on and off through the years to keep the train at the park. It must cost a pretty penny to insure - especially if the insurance company has figured out that this sign is totally ineffective. Sharlene on March 19, 2010 at 8:54 a.m. The lawyer comfort sign cracks me up. It sad that we live in a world where those signs are even needed. What ever happened to common sense? Print Greeting Cards on March 19, 2010 at 2:27 p.m.
That's literally a sign of the times. Yeah, it's kind of sad. Becky C. on March 24, 2010 at 2:23 p.m. I love that it looks like they had to change "AN historical exhibit" to "A historical exhibit". Debbie Oreizy on March 24, 2010 at 7:22 p.m.
HA. I didn't even notice that! Whit Honea on April 2, 2010 at 1:57 p.m. Here's one for this week. Today is Friday, right? I lose track.